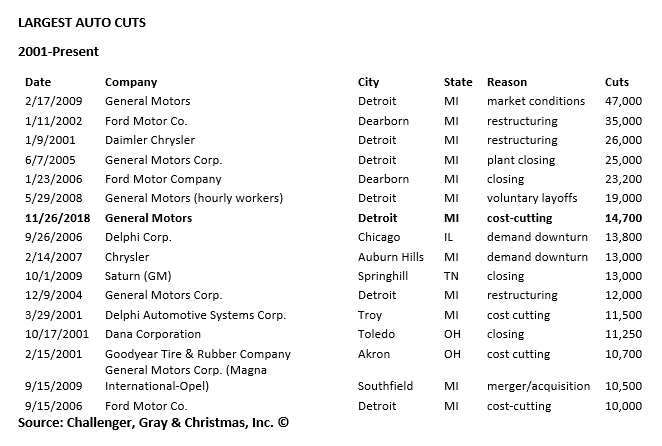 GM Cuts 14K Jobs, 7th Largest Auto Cut Since 2001 | Page 3 | Challenger, Gray & Christmas, Inc.
UPDATE: General Motors is cutting up to 14,000 workers. General Motors announced it would cut 15 percent of its salaried and salaried contract staff, or an estimated 14,000 people, as the company looks to cut costs and pivot to electric vehicles. Meanwhile, CEO Mary Barra says the company is still hiring workers with experience in software and tech to in order to transition to vehicles with new technologies. This announcement will more than double the number of job cuts announced by US companies in the Automotive industry in 2018, according to tracking by global outplacement and executive coaching firm Challenger, Gray & Christmas, Inc. Through October, the Automotive industry has announced 14,489 job cuts. That's compared to 16,291 cuts in the Automotive sector through October 2017. "The announcement by GM is on trend with other major companies who are pivoting due to disruptive technologies. We've seen major announcements from companies in the Financial and Tech industries this year, as those industries respond to changes in consumer activity," said Andrew Challenger, Vice President of Challenger, Gray & Christmas, Inc.
"These large-scale job cut announcements do not necessarily spell a downturn, although a downturn could very well be on the horizon. Rather, companies are capitalizing on the good economy to position themselves for growth," he added. "Meanwhile, for workers who are transitioning out of the company, now is a good time to be conducting a job search, as the tight labor market means their skills will be in demand. Finding new employment may not be as difficult as during a period of higher unemployment," said Challenger. This is the seventh-largest Automotive job cut since 2001, according to Challenger.